Harvard University Press, 9780674971479, 400pp. This is the story of how America's first women soldiers helped win World War I, earned the vote, and fought the U.S. Army. In 1918, the U.S. Army Signal Corps sent 223 women to France. They were masters of the latest technology: the telephone switchboard. General John Pershing, commander of the American Expeditionary Forces, demanded female "wire experts" when he discovered that inexperienced doughboys were unable to keep him connected with troops under fire. Without communications for even an hour, the army would collapse. While suffragettes picketed the White House and President Woodrow Wilson struggled to persuade a segregationist Congress to give women of all races the vote, these competent and courageous young women swore the Army oath. Elizabeth Cobbs reveals the challenges they faced in a war zone where male soldiers welcomed, resented, wooed, mocked, saluted, and ultimately celebrated them. They received a baptism by fire when German troops pounded Paris with heavy artillery. Some followed "Black Jack" Pershing to battlefields where they served through shelling and bombardment. Grace Banker, their 25-year-old leader, won the Distinguished Service Medal. 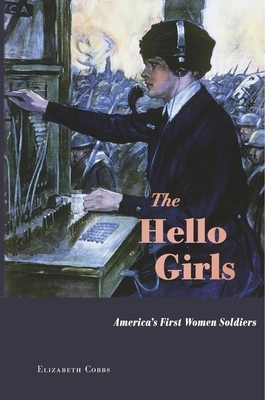 The army discharged the last Hello Girls in 1920, the same year Congress ratified the Nineteenth Amendment granting the ballot. When the operators sailed home, the army unexpectedly dismissed them without veterans' benefits. They began a sixty-year battle that a handful of survivors carried to triumph in 1979. With the help of the National Organization for Women, Senator Barry Goldwater, and a crusading Seattle attorney, they triumphed over the U.S. Army.